He has a way of getting his way, he has a method; he will charm a man or bribe him, coax him or threaten him, he will explain to a man where his true interests lie, and he will introduce that same man to aspects of himself he didn’t know existed. Every day Master Secretary deals with grandees who, if they could, would destroy him with one vindictive swipe, as if he were a fly. Knowing this, he is distinguished by his courtesy, his calmness and his indefatigable attention to England’s business. He is not in the habit of explaining himself. He is not in the habit of discussing his successes. But whenever good fortune has called on him, he has been there, planted on the threshold, ready to fling open the door to her timid scratch on the wood. At home in his city house at Austin Friars, his portrait broods on the wall; he is wrapped in wool and fur, his hand clenched around a document as if he were throttling it. Hans had pushed a table back to trap him and said, Thomas, you mustn’t laugh; and they had proceeded on that basis, Hans humming as he worked and he staring ferociously into the middle distance. When he saw the portrait finished he had said, ‘Christ, I look like a murderer’; and his son Gregory said, didn’t you know? observations: The Man Booker Prize for 2012 went to Hilary Mantel last night, for Bring up the Bodies – a huge surprise because it was so obviously the right choice, and Booker juries are notoriously unpredictable. She won the prize for its forerunner, Wolf Hall, in 2009, and it seemed that might be her lot. The Booker is very successful in one direction: it amasses a huge amount of publicity. But it couldn’t ever be painted as truly an award for the best book of the year – its aim is to sell books, not quite the same thing, so wayward selection panels and controversy are always important. 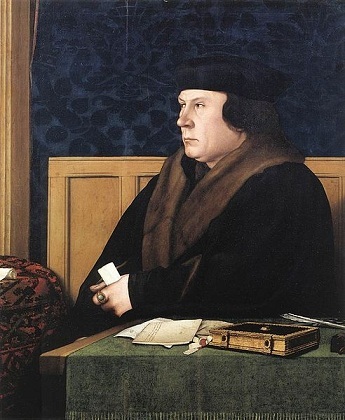 But this time, Thomas Cromwell’s stars were in the right place - good fortune called on him, and he was there. These two books surely will be read forever – Mantel’s ability to create a world and enter her protagonist’s head is extraordinary. Most historical novels based on real events leave the reader wondering ‘is that true, what are the known facts about this, well surely no-one knows…’; but these two have the opposite effect, and you have to keep reminding yourself that it is just a construction, that he probably wasn’t like that at all, and this isn’t the final and correct explanation – as it feels – for all those events of the 1520s and 1530s. Links up with: both books have featured before, here and here, and Tudors and Boleyns were on our mind last week as well, twice. The picture is one version of the Holbein portrait described above.